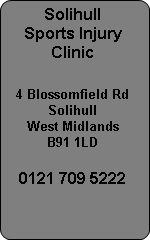 Stretching advice from Solihull Sports Injury Clinic involves both maintenance stretching and developmental stretching. One stretch brings the muscle back to pre- exercise length and the other increases the muscle length. Many people stretch incorrectly which results in the stretch being ineffective. Stretches can be performed by a practitioner using muscle energy techniques or advice and instruction for the patient on stretches that they perform at home. The main mistake when trying to lengthen muscles is that the stretches are not held for long enough and stretching is too aggressive. Solihull Sports Therapist John Williams has lectured to fitness instructors and personal trainers on stretching techniques and currently operates as the Clinic Director of Atlas Sports Injury Clinic in Solihull and Tamworth. If you need to lengthen a muscle you have to do this progressively and allow time. First do not stretch too hard, a gentle stretch will do in order to stretch correctly. Begin the stretch and hold it until you feel it ease. This can take minutes not seconds. Wait for an easing and slowly take it to its next barrier and begin again. This should be repeated in one session of stretching and could take between 5 and 10 mins to complete. What is involved is the protection of muscles that we have to overcome if we want to lengthen them. We have Muscle Spindle Cells and Golgi Tendon Organs which protect our muscles from overload and overstretching. Muscle spindle cells live inside the muscle and detect stretch. When the muscle reaches its normal maximum length the muscle spindle cells request the muscle to contract. This is an automatic response and will prevent the muscle stretching. In effect you are pulling in one direction and the muscle contraction is pulling in the opposite direction creating a tug of war. The harder you stretch the stronger the counter contraction. If you wait, the muscle will slowly release the counter contraction and their will be a feeling of relaxation. Slowly increase the stretch into the next barrier where you will get another counter contraction and repeat. Golgi Tendon Organs are involved with detecting increased load on the tendon of the muscle and live in the tendon. If you overload the muscle the golgi tendon organs will switch the power off to that muscle in order to protect it from tearing the muscle. These are not involved in stretching but in contraction and overload of a muscle.